Beautiful cabin-Rubicon Bay, Hot tub, Private BOCCE ct. Best Beach in Tahoe! 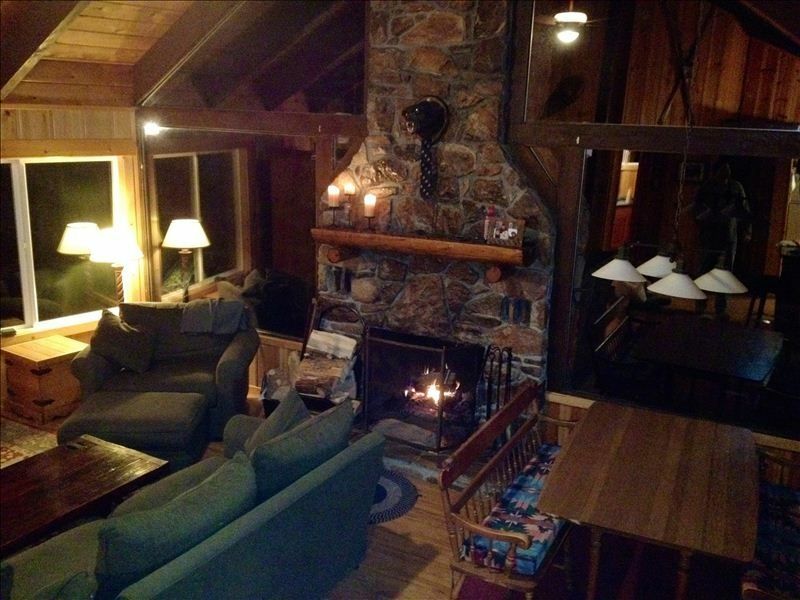 Cabin, 4 Bedrooms + Convertible bed(s), 2 Baths, (Sleeps 8) Volleyball,Bocce ct. Enjoy the true Lake Tahoe experience in this beautiful home. Remodeled . Granite countertops in kitchen with top of the line appliances. Large deck with hot tub and gas BBQ .Fantastic TV/Stereo with surround sound. Located on the lakeside of Highway 89, five minute walk to private homeowners beach, white sand, volleyball, pier, and the most crystal clear water in Lake Tahoe. Play a game of BOCCE BALL.. Free use of new S.U.P. while you BBQ at the cabin.lots of board games for the family... swim, hike, mountain bike or just relax.very peaceful.no road noise.. brand new BBQ, boat buoy available ,must be booked in advance.. New Bocce ball court, we have internet. Fantastic stereo,ipod set up, satellite TV -DVD with surround sound. The cabin sleeps eight in beds and 10 with the new sofa bed. This cabin is furnished to the highest standards. Experience a true Lake Tahoe vacation with all the modern amenities.BOAT BUOY available most times,need 2 weeks notice. peace and quiet,old tahoe feel in rubicon bay, great family area..easy stroll to beach,pier,volleyball,boat buoy available. beautiful white sandy beach..Great area for kids to play.Beautiful hot tub on the deck.. Your own bocce ball court. New BBQ on deck. when you sit on the deck or the hot tub, you look out to the trees and sky and not another home. The most beautiful private beach in tahoe. great surround system with alexa/iphone hook up and cd player. many board games for the family. free use of new stand up paddle board. Our multi- age family spent a wonderful week at the end of June/July at this beautiful cabin! Before the trip, the owner always answered questions quickly and was very easy to deal with. Once we arrived, there was parking for 3 cars and the cabin was clean. The kitchen was stocked with all of the necessities for great family meals. We enjoyed the bocce ball court, hot tub, volleyball at the beach, and taking walks around the neighborhood. But most of all, we LOVED the private, sandy beach. After morning activities/hikes nearby, our family always finished off the afternoon lakeside. The beach was a quick walk (although, we drove and parked near the entrance because of all of our gear). We always had plenty of space on the beach on both sides of the dock and the water was the kind you dream of....blue, clear with plenty of sand. We loved Rubicon Bay and most of all, loved this cabin! My family of 6 have been renting many homes in rubicon over the past 10 years and this home was the best of them all.The house was very clean and furnished to a high standard,when your on the large deck or in the hot tub you are looking at the trees and the sky line and not other homes. We enjoyed playing bocce ball on our own court and making lareg family dinners in the new kitchen.The 5 minute walk to the most beautiful beach in tahoe was an added plus. The owner was great to deal with it, can wait to return. We loved this house. It was very clean, kitchen was new and the hottub was an added bonus. We loved that it was in a quiet neighborhood with a private beach that was never crowded. The beach was only a 5 minutes walk or less from the house. We've stayed on the north and south sides of Lake Tahoe and Rubicon bay was by far our favorite because it was away from the crowds of people. When we come back we will definitely be staying in this house! This house is in a great location. Our family and our pets spent the holiday and took advantage of the abundant supply of firewood and hot tub. The kitchen was well stocked and easy to work in. Summer's coming and we would like to go back and take advantage of the private beach and bocce ball court. The owner was extremely helpful and easy to work with. Our family recently stayed at this cabin and we really enjoyed ourselves. The cabin was beautiful with a great layout. The kitchen was perfect for us when we were cooking our nightly meals, the deck had stunning views of the woods and it felt like a home away from home! I highly recommend staying here and seeing what Rubicon Bay really has too offer. We stayed in Rubicon at this cabin and had a great vacation. The house had a nice view of the lake and plenty of room for us all. I didn't think we'd be using the hot tub but when a thunderstorm came through, it got chilly and that was a great warm up. The owners were great to deal with as well and even returned a necklace my wife left behind. Can't wait to go back to Rubicon next summer! SUMMER RENTALS 7 NIGHTS MINIMUM. FRIDAY-FRIDAY. PETS must be pre-approved.